We’re set up at the Country Living Fair in Stone Mountain Park in Atlanta this weekend, and we have the most idyllic booth space. The park is lovely, sprawling and green and beautifully wooded. When we were setting up our booth, we weren’t sure what we were going to do with our umbrellas. We normally hang them from the top of our tent, and we are in a smaller, shorter tent here. I looked up and saw two trees behind our booth that screamed at me. And there it was: the most perfect display ever! We tied our rope between the trees, and our umbrellas have been hanging in the sun all weekend. Isn’t it a delight to look at?! I snuck down below them and took this shot, looking up into the trees. 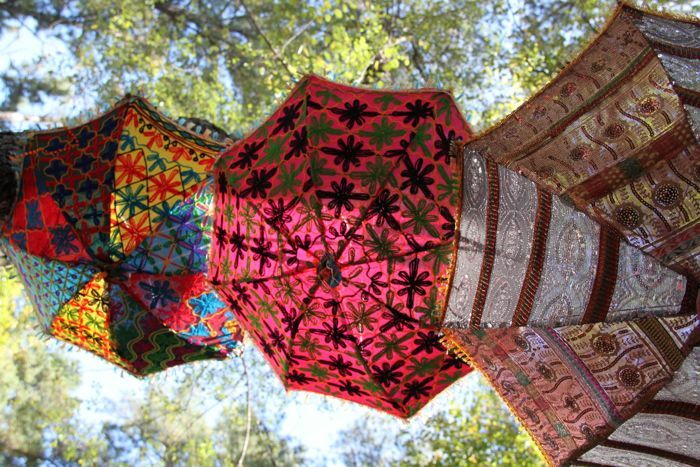 GypsyTemple parasols hanging in the sun at the Country Living Fair, Stone Mountain, GA. Your Umbrellas are beautiful. Would be a great idea for a sunny spot in the backyard. Would you please let me know how this fair was selling wise. I am moving back to the Atlanta area this summer and will be looking for 3 or four craft fairs a year to sell in. Any suggestions from ones you have sold at would be wonderful. Thanks.